When we aim at seeing who is doing what in terms of e-participation (and in political participation in general) it is quite usual to look at the capacities that individuals have to perform a given action and how many of these actions actually took place. In other words, and in the field of e-participation, we look at the level of digital literacy of individuals in a community and how they engaged in the e-participation initiatives that were offered to them. This perspective has, at least, two issues that need being addressed. The first one is quite obvious and has been the focal point of some initiatives like UNPAN’s series of e-Government surveys (UNPAN, 2016). That is, that not only citizens but also the Administration (and everything that spins around it: all other powers, political parties and lobbies, etc.) need to be e-ready. This e-readiness should, at least, be taken into consideration in two different fronts: whether there are the technological infrastructures available and whether public servants can use them and have the appropriate digital skills (Peña-López, 2010). But these skills – both now at the citizen and the public sector levels – are not only about achieving a sufficient degree of knowledge in handling some specific hardware. First of all, there is the capacity (Sen, 1980) to make conscious and subjective choices in one’s own benefit (not just “using); second, there is the power to make choices that are effective, that can actually take place and make an impact (or, at least, increase the potential for that impact) (Welzel et al., 2003). This is crucial, because we do know that the digital divide in politics (Robles et al., 2012) affect the outcomes of policy-making, but it is much more complex than just a matter of access (Cantijoch, 2014). We have growing evidence that the Internet and politics engage in a virtuous (or vicious, depending on the spin) circle (Colombo et al., 2012) that either leads to more empowerment and political efficacy, with an increase of Internet usage, and back to empowerment and efficacy – or just the opposite in cases of lack of Internet and/or different attitudes toward participation. Thus, if the digital divide actually shifts to differences in usage (Van Deursen, van Dijk) and not just in a matter of intensity of engagement, it is crucial to accurately map and assess how both individuals and institutions are ready for e-participation, and how and what initiatives have been put in practice to improve the e-readiness of the actors that participate in politics. But this is only half the equation: how ready actors are. What about what they are doing and, more interestingly, where and how they are doing it? The other half of the equation is where would institutions and people put their e-readiness at work. But if the very concept of skills, capacities and effective usage has changed, so have the concepts of “places” and “means” in the digital age. Many institutions nowadays have their design rooted in the scientific and the industrial revolutions. The advancements of science (including the ethics and philosophy of the Enlightenment) and the advancements of technology provided solid ground where to build, among other things, liberal democracies and the institutions that make them up: parliaments, governments, the judiciary system, political parties, lobbies and civic organizations, etc. But most of these grounds exist no more, or at least they have been direly transformed in their inhibiting potential, especially in what implies coincidence of time, space and the cost to coordinate interactions, exchanges and transactions in general (Benkler, 2002). In this new landscape, networks emerge instead of hierarchical organizations, creating new institutions and reshaping the old ones (Benkler, 2006). In political participation, this means the creation of new spaces and strategies for information, communication and civic action (Castells, 2009, 2012) that, notwithstanding, often fall outside of the mapped territories and below the line of the radar of democratic institutions. These new, unmapped territories range from what has been called lurking (Nonneke & Preece, 2003) or slacktivism (Christensen, 2011) to para-institutions (Peña-López et al., 2014), but it is arguable that these new e-participation extra-representative or extra-institutional practices are as legitimate and useful as other traditional ones (Peña-López, 2013). On the one hand, because it may be interesting to approach these initiatives not as an “exit”, in terms of Albert O. Hirschman (1970), but as citizens moving away from institutions that do not answer to their needs and into other new institutions that may, that is, they are voting with their feet (Tiebout, 1956) but not in terms of municipality but in terms of democratic institutions. Still today we see reactions (again in the sense of Hirschman, 1991) that tend to redirect extra-institutional participation towards institutions, that tend to silent these initiatives because they harm democracy or because they are useless. We here propose, instead, to map and characterize all the initiatives that, after having built capacity on actors (individuals or collectives, institutions or distributed networks), not only aim at attracting them to traditional ways of participation but enable new spaces and actions by creating the conditions to support bottom-up distributed e-participation initiatives. Naming and framing issues, identifying the relevant actors, feeding actors with the relevant information, facilitating appropriate exchanges between approaches and positions, easing negotiation, fostering decisions, setting the ground for appropriate accountability. This landscape can but grow. The later it is appropriately measured and facilitated, the more difficult it will be to establish bridges between capacity building and intervention, and between institutional interventions and distributed and networked civic actions. Cantijoch, M. (2014). La desigualdad digital, ¿una nueva fuente de desigualdad política?. ZOOM Político/2014/23. Madrid: Fundación Alternativas. Christensen, H.S. (2011). “Political activities on the Internet: Slacktivism or political participation by other means?”. In First Monday, February 2011, 16 (2). [online]: First Monday. Colombo, C., Galais, C. & Gallego, A. (2012). “El uso de Internet y las actitudes políticas. Datos cuantitativos y cualitativos de España”. In Arbor. Ciencia, Pensamiento y Cultura, 188 (756), 751-766. Berkeley: Berkeley Electronic Press. Hirschman, A.O. (1970). Exit, Voice, and Loyalty. Cambridge: Harvard University Press. Hirschman, A.O. (1991). The Rhetoric of Reaction. Cambridge: The Belknap Press of Harvard University Press. Peña-López, I. (2010). “From laptops to competences: bridging the digital divide in higher education”. In Revista de Universidad y Sociedad del Conocimiento (RUSC), Monograph: Framing the Digital Divide in Higher Education, 7 (1). Barcelona: UOC. Peña-López, I. (2013). “Casual Politics: From slacktivism to emergent movements and pattern recognition”. In Balcells, J., Cerrillo i Martínez, A., Peguera, M., Peña-López, I., Pifarré de Moner, M.J. & Vilasau, M. (Coords. ), Big Data: Challenges and Opportunities, 339-358. Proceedings of the 9th International Conference on Internet, Law & Politics. Universitat Oberta de Catalunya, Barcelona, 25-26 June, 2013. Barcelona: UOC-Huygens Editorial. Peña-López, I., Congosto, M. & Aragón, P. (2014). “Spanish Indignados and the evolution of the 15M movement on Twitter: towards networked para-institutions”. In Journal of Spanish Cultural Studies, 15 (1-2), 189-216. New York: Routledge. Robles Morales, J.M., Molina Molina, Ó. & De Marco, S. (2012). “Participación política digital y brecha digital política en España. Un estudio de las desigualdades digitales”. In Arbor. Ciencia, Pensamiento y Cultura, 188 (756), 795-810. Berkeley: Berkeley Electronic Press. Sen, A. (1980). “Equality of What?”. In The Tanner Lecture on Human Values, I, 197-220. Cambridge: Cambridge University Press. Tiebout, C.M. (1956). “A Pure Theory of Local Expenditures”. In Journal of Political Economy, 64 (5), 416-424. Chicago: The University of Chicago Press. UNPAN (2016). UN e-Government Survey 2016. E-Government in Support of Sustainable Development. New York: UNPAN. Van Deursen, A. & van Dijk, J. (2013). “The digital divide shifts to differences in usage”. In New Media & Society, 16 (3), 507-526. London: SAGE Publications. Welzel, C., Inglehart, R. & Klingemann, H. (2003). “The theory of human development: A cross-cultural analysis”. In European Journal of Political Research, 42 (3), 341-379. Oxford: Blackwell. Peña-López, I. 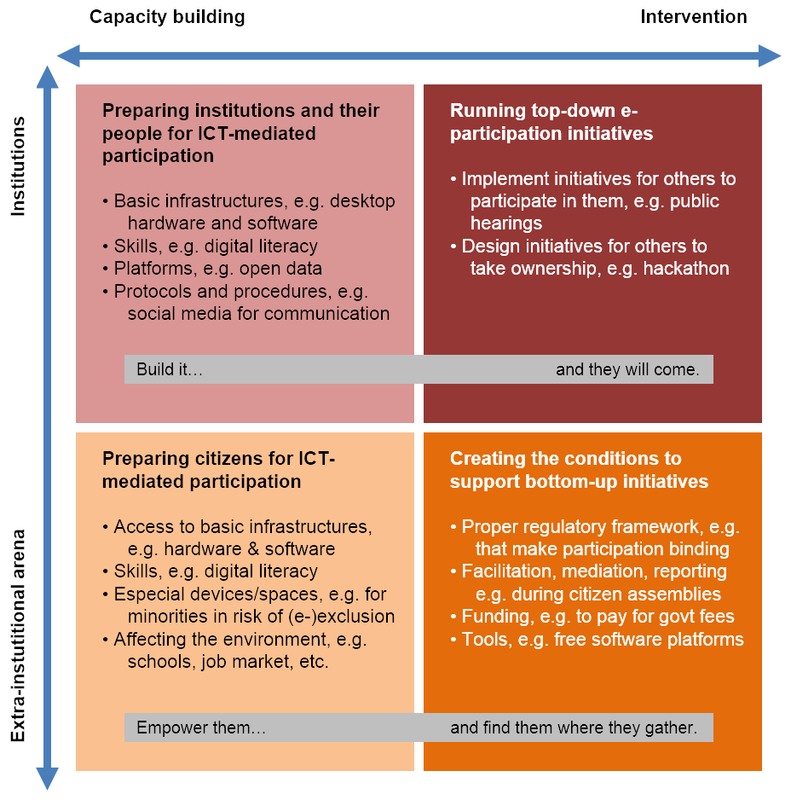 (2017) “e-Participation: from capacity building to governance” In ICTlogy, #166, July 2017. Barcelona: ICTlogy.